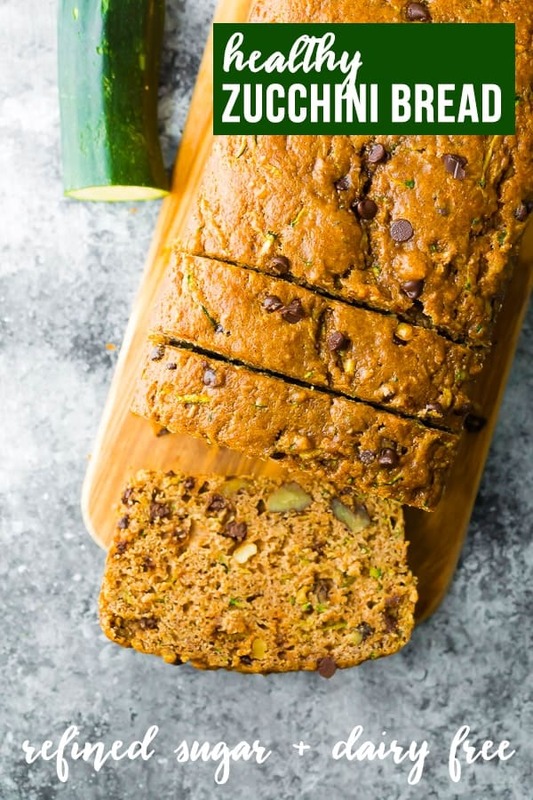 Healthy zucchini bread is packed with fresh zucchini, has no refined sugar, just a touch of coconut oil, and whole wheat flour. The perfect healthier treat to enjoy with a cup of coffee. Sometimes I get these nagging cravings and they just won’t go away until I indulge in them…and this summer, it has been zucchini bread! 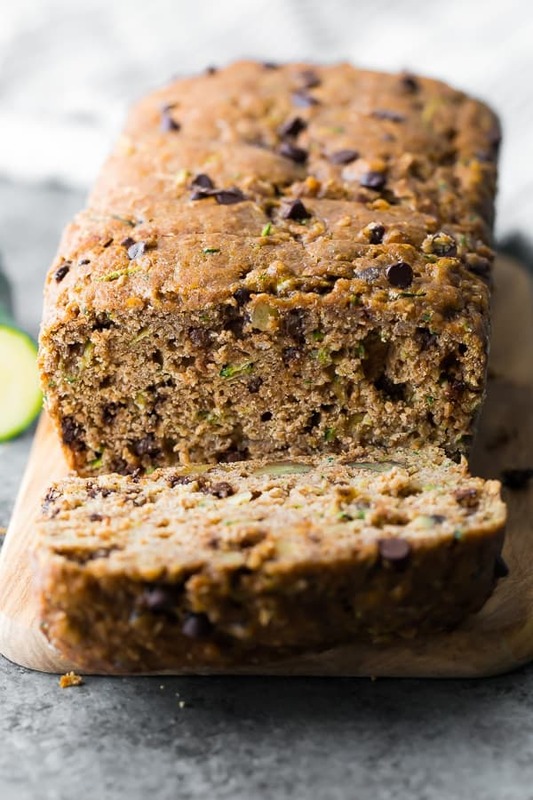 This healthy zucchini bread recipe totally satisfied my cravings…it was slightly sweet, perfectly moist, with a crunch from the walnuts and a little hit of chocolate from the mini chocolate chips. 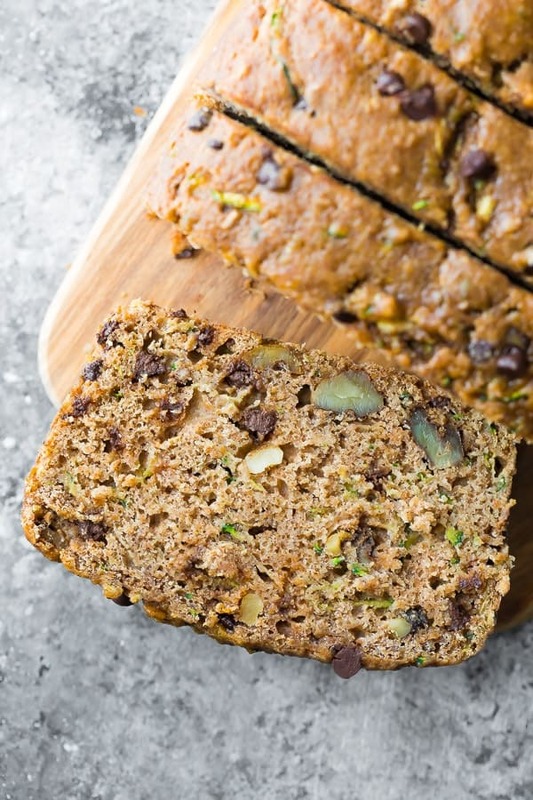 Some zucchini bread recipes have a TON of oil and sugar in them, and I love that this recipe only uses a touch of coconut oil and no refined sugar. 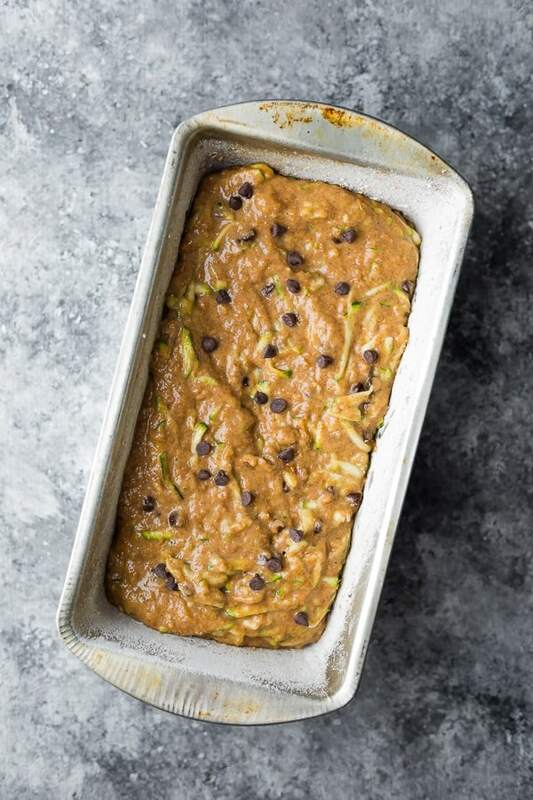 You can have this healthy zucchini bread ready for the oven in under 20 minutes. Shred the zucchini, then allow it to sit for 10 minutes sandwiched between paper towels. While you’re waiting on the zucchini, stir together the dry ingredients. Melt the coconut oil, then add in your wet ingredients. 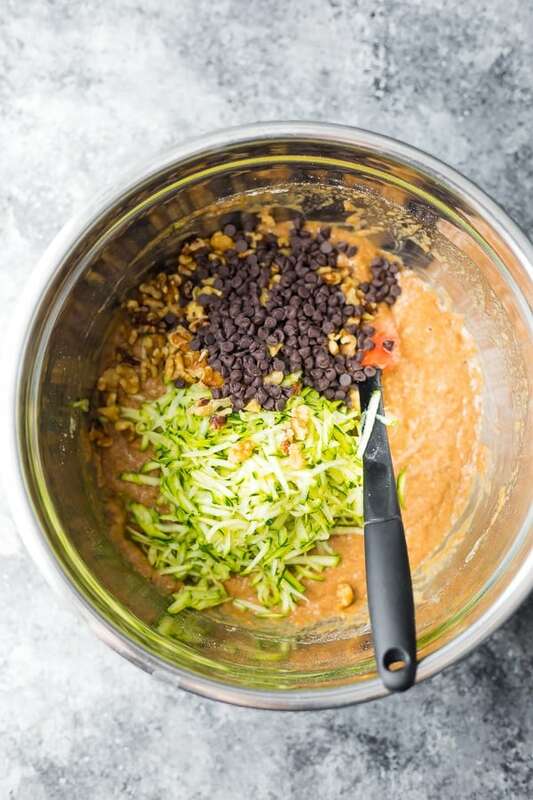 Mix everything together, including the zucchini, mini chocolate chips and walnuts. Bake in a floured loaf pan for 1 hour. 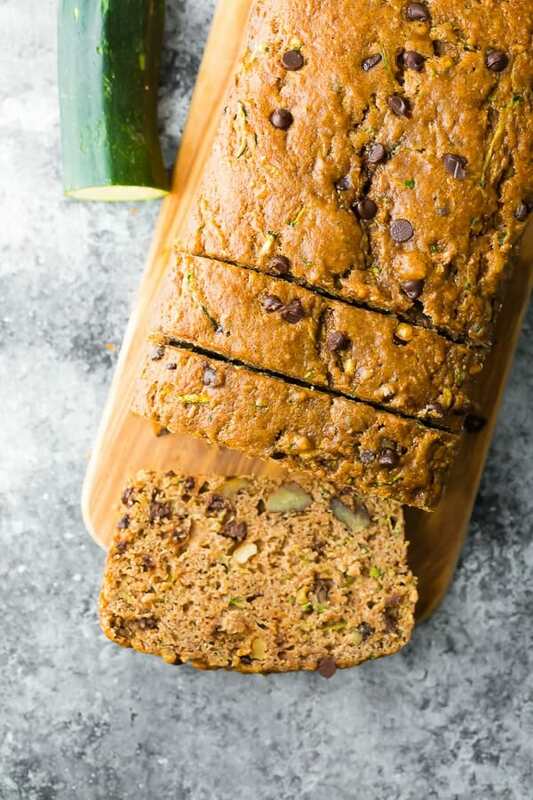 Can this chocolate chip zucchini bread be frozen? Yes, we love doubling this recipe and freezing it! I wrap mine in plastic wrap and store in an air tight container or ziplock freezer bag. Does zucchini bread need to be refrigerated? I prefer to refrigerate it because it will help it last for longer, but it also seems to stay moist that way. We store it right in the loaf pan and cover with beeswax wrap for up to 5 days. 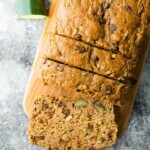 Can I use swap the zucchini out in this chocolate chip zucchini bread recipe? Yes! You can swap the zucchini out for a number of different things including yellow squash, shredded carrots and shredded apples. Heat oven to 325°F. Spray and flour a 9 x 5 inch loaf pan, set aside. Shred zucchini on a box grater. Place on a paper towel and cover with a second paper towel. Allow to sit for ten minutes, and gently press to transfer extra liquid to the paper towels. In a large bowl, stir together the flour, salt, baking powder, baking soda and cinnamon. In a large microwave safe bowl, melt the coconut oil. Stir in the applesauce, maple syrup, vanilla and eggs. If coconut oil starts to solidify, microwave the liquids for 20 seconds at a time until coconut oil is melted again. Stir the wet ingredients into the dry and mix until no flour clumps remain. Fold in the zucchini, chocolate chips and walnuts. Transfer to the loaf pan and bake for 55- 1h5m, until a toothpick inserted in the middle comes out clean. Allow to cool completely. Run a knife around the outside of the pan to loosen, then invert the pan and give it a couple of firm smacks to release the loaf from the pan. Store in a sealed container in the fridge for up to 5 days. Wrap in plastic and store in a sealed container or bag in the freezer for up to 3 months. Hi Valerie! I would say it was likely the greek yogurt that was the problem, not the flour. And yes, you really need to press the moisture out of the zucchini. This WAS the BEST zucchini bread ever! I swapped the whole wheat flour for White whole wheat flour, swapped out 1/2 the maple syrup for lakanto maple syrup (so it was 50/50), and left out the chocolate chips/nuts….. THank you for such an awesome recipe! Wow, thank you, Lisa! That’s amazing. I can’t seem to find white whole wheat flour here in Canada. I need to get some and try it out!